I’d like to start this particular review by saying that the customer support representative who refunded all of our money was awesome. That might give you an indication of how Steve and I feel about the Explore Bike Share service. 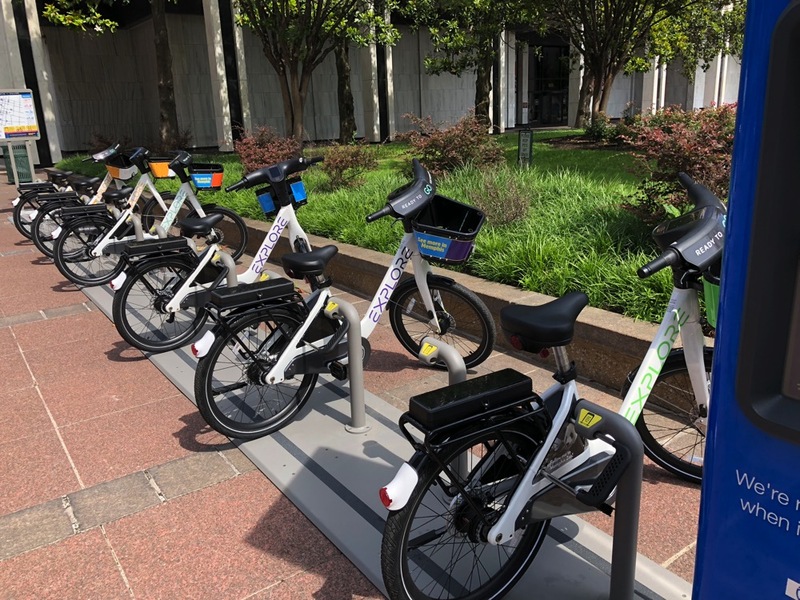 We were in Memphis for the weekend and had walked a fair bit of the city, and when we saw the opportunity to rent electric bikes we thought that sounded really fun. We’d been wanting to try an electric bike and renting one was a great way to do it. Being able to ride for a while and then drop the bike off at another station would be ideal. Explore bikes have solar panels to charge, a nice dorky basket to carry your stuff in front. They have two ways you can rent, either through a kiosk with a credit card, or using their BCycle app on your phone. We didn’t really want to mess around with downloading an app before finding out this was something we wanted to do it again. I started poking the touchscreen on the kiosk, and it was one of those annoying ones that doesn’t respond to every touch. 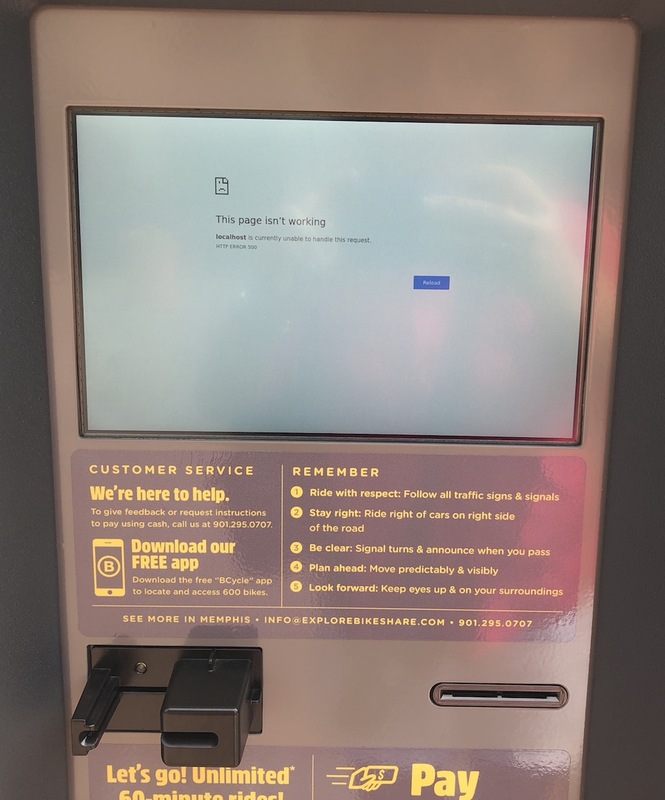 When it finally did respond, I got an error screen that looked a lot like Chrome talking, where it said, “This page isn’t working. localhost is currently unable to handle the request HTTP ERROR 500”. There was a reload button, but the screen had decided it was vacation time and wouldn’t respond to our touch or poke or smash or pound. Ok, download the BCycle app it is. I know it makes sense since we’re renting an expensive device, but we were still annoyed that we had to create an account, choose a password (it only prompted once os no password matching), and then we had to give it our phone number and Credit Card number. It didn’t have any 1Password integration so it was a lot of wiping back and forth and copying and pasting. Finally we had our accounts and were ready to go. Then the app asked us to log in. Ok, fine. And the app said my password was wrong. Seriously? When I created it, I copied it from the account setup screen, and pasted it into 1Password, then when prompted, I copied it from 1Password and pasted it back into the app, so I KNEW I had it right. I initiated a new password request and it rather quickly sent me an email reset link, and I pasted in the same darn password I’d asked for originally and it said that was swell. While I was doing the password reset dance. Steve had started to rent a bike. The process is fairly straightforward. There’s a touch screen between the handlebars of each bike and when you tap it, a 6-digit code comes up on screen. In the BCycle app, you tap on an icon of a bicycle, and it asks you how long you want to rent the bike. 1 hour was $5 and since we only had an hour to play, he picked that option. The app prompted him to enter the 6-digit code from the bike. Then it told him he had 10 seconds to unlock the bike. The bikes are physically locked to the bike stand with a giant U-shaped bar. Steve began wrestling with this bar and after a considerable amount of yanking and jiggling it came loose. Now he had to do something with this big U-shaped metal bar, He realized there were holes in the bike, and since he would need it when we put the bike back in a new bike rack, he inserted it into the holes in the bike. This was a critical failure of process, because it locked the bike again, so he couldn’t ride it and couldn’t put it back. To be fair to the Explore Bike Share people, they did put instructions in the dorky basket up front explaining how to insert the U into the holes in the basket. But of course Steve wasn’t yet sitting on the bike so he hadn’t looked in the basket when this happened. Now he’s got a bike out of the rack, but it’s locked. He went back into the app and it had not gotten the message that the bike was locked, so instead of giving him a screen to unlock it again, it was suggesting some lovely paths in downtown Memphis for a bike ride. The only option we could think of was to have me unlock the bike with my app on my phone. We figured this would cost us another $5 but at least we’d be able to get going. We successfully entered the 6-digit code on my app and the bike unlocked and Steve was again able (with some difficulty) to wrestle the U-bar loose and then put it in the holes in the basket. We have now successfully paid $10 to rent one bike. Now how about a bike for me? Well, Steve’s app still thought he was on a ride, and now so did mine. Turns out the BCycle app does not allow you to rent a second bike! Weird – how would you rent one say for you and a kid or someone who didn’t have the app or a credit card? At this point Steve found an option in the app to call customer service. A very nice, and capable woman confirmed that the system knew Steve’s bike was unlocked and that it was my account that was on a ride. Luckily by this time, Steve’s app had gotten out of its funk and was ready to let him rent a bike. Our new little friend walked Steve through how to rent the bike again, but this time read him a discount code over the phone to give him a free ride. He used this code to rent a bike for me. The code worked, so he entered the 6-digit code from my bike into his app and the app told him he had 10 seconds to unlock the bike. I’ve mentioned a few times that it was a bit of a physical struggle to yank that U-bar out, but this time it simply refused to come out. Steve is quite strong and yanked it every which way, but it was not going to come out. Luckily we had kept our customer support rep on the phone. I took over and told her that while she’d been lovely and very helpful, we had now spent 26 minutes successfully spending $10 to only rent one usable bike, and that we were done now. She immediately told us she’d generate a refund to each of our accounts for the full $10 and we could be on our way, albeit on foot. It’s altogether possible that you would have a different experience with Explore Bike Share, because we did see a family of four merrily ride past us later as we trudged along on foot, but in our experience, the kiosk software has some big problems, the physical locks are difficult to remove, and the BCycle app gets easily confused on passwords and whether or not you have a bike in your possession. Like I said at the beginning, the woman on customer support was lovely.